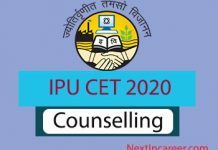 Candidates who are participating in the IPU CET counselling will be given seats in the affiliated colleges through IPU CET seat allotment 2020. Check the procedure for seat allotment where candidates will be required to login and download their seat allotment letter. Candidates will also have the option to give up their seat. The registration for the seat allotment will commence and candidates will be required to fill in their choices of college and course preference wise. The IPU CET counselling and seat allotment are likely to to be conducted in the month of June 2020. 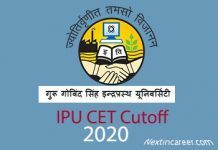 IPU CET 2020 seat allotment will be done based on the candidates, merit, availability of seats and the choices of college and courses entered by the aspirant. Based on the rank class and choices filled by the candidate, the seats will be allotted to the candidate. Candidates will be required to login and check their seat allotment status. A provisional allotment letter (PAL) will be sent to the candidate and he/ she must make sure to download and take a print out of it. In order to accept the allotted seat, candidates must pay the academic fee of Rs. 40,000. After payment, take a print of the admission fee receipt. 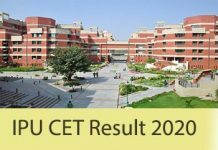 Seat Allotment Round 1: The IPU CET seat allotment 2020 round 1 will be conducted in the 3rd week of June 2020. The seat allotment will be after each round of counselling. Those candidates who do not wish to take the seats in this round will be granted second preference seats in the next round. Seat Allotment Round 2: The 2nd round of seat allotment will be taking place in 1st week of July 2020. Seats that were left vacant in the 1st round will be filled in the 2nd round of IPU CET counselling. Seat Allotment Round 3: This will be the last round of seat allotment and candidates who want to withdraw seat can do it till this round only. After this round, if there is a spot or additional round, candidates will not be allowed to withdraw seats. IPU CET 2020 Provisional Allotment letter (PAL) will be displayed. Download and take a print out of it for further use. If candidates are satisfied with the seats allotted to them, they must freeze the seats indicating they don’t want to participate in further rounds of admission. Candidates can log in and click on the freeze option. If the candidates do not accept the allotted seat, he/she will be allotted the next preference seat in the next round. If there are seats left even after the last round of IPU CET 2020 counselling, the spot round will be held for candidates to fill the seats. After this round, no student will be allowed to withdraw their seat. Also, the category-wise and region-wise seats will be converted to general category seats. Finally, those who have been allotted seats through IPU CET seat allotment 2020, each candidate will be required to visit the reporting centres and get their certificates and documents verified. The merit/ rank list of the respective CET Code prepared for Delhi Region candidates will be used for allotting seats. The candidates who have passed the qualifying examination through Distance/Open Education system of any recognized University/ Institute and had his/ her Study Centres in Delhi will be considered as Delhi Region Candidates but the responsibility to provide proof of his/ her study centre in Delhi will be of the candidate only. The merit/rank list of the CET prepared for Outside Delhi Region Candidates will be used to fill up these seats. The candidates who have passed the qualifying examination through Distance/Open Education system of any recognized University/ Institute and had his/ her Study Centres outside Delhi will be considered as Outside Delhi Region Candidates but the responsibility to provide proof of his/her study centre outside Delhi will be of the candidate only. For institutions located in the National Capital Region (NCR) outside the National Capital Territory of Delhi (NCTD), the division of seats between Delhi candidates and outside Delhi candidates will be as per the directions of the Govt. of NCTD directions received before the commencement of counselling/ admissions in this academic session. If you have any comments, do ask us in the comments section below!